West Windsor, N.J. – In what has become an annual outing for many in the local business community, generous corporate supporters and other enthusiastic friends came out in large numbers for Mercer County Community College’s (MCCC) 24th Annual Golf Classic on Sept. 29, hosted by the MCCC Athletics Department and Foundation Board. The tournament raised significant dollars that will be donated to the MCCC Student Athlete Scholarship Fund, with proceeds topping $22,000 for the third consecutive year. The college welcomed 96 golfers to Mercer Oaks in Princeton Junction, NJ. The cloudy skies – a precursor of days of rain – proved ideal golf weather as participants enjoyed a fun day on the links for a worthy cause. The event commenced with a putting contest and lunch. Fifteen MCCC athletes, representing almost all of the college’s ten teams, had a chance to circulate among the guests and thank them for their participation. 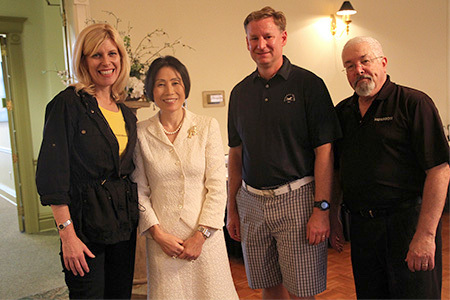 In her comments prior to the shotgun start, MCCC President Jianping Wang noted the importance of community participation in helping students achieve their dreams. “Your generosity is truly making education possible for our students,” she said. Following the tournament, golfers joined together in the Mercer Oaks ballroom, where they enjoyed dinner and an awards ceremony. A highlight of the evening reception was a silent auction featuring sports related items, including generous donations of foursomes by numerous premier golf courses in the region. Four donors stepped up as the tournament’s main sponsors: The Fowler Family, Homosote, Investors Bank, and Mrs. G's. Other sponsors included Architectural Window Manufacturing, Borden Perlman Salisbury & Kelly, Clarke Caton Hintz, David Fraytak, First Choice Bank, Fulton Bank, Haldeman Lexus, Harrison-Hamnett, P.C., Hill Wallack LLP, Hopewell Pharmacy, Hopewell Valley Community Bank, The Mercadien Group, PFM Asset Management, Princeton Air Conditioning, Prism Advisory Group LLC, PSE&G, Spiezle Architectural Group, Stark & Stark and Thomas Edison State College. For the second year, golfer sponsors have had scholarships established in their names in recognition of their support. The scholarships are presented to deserving student athletes at the Continuing Student Recognition Ceremony, held annually in late October. Links to sponsors' websites can be found in the right-hand column of the event page here. Co-chairs for the event were Lori Danko, David Fraytak, and Allen Silk. The committee also included Herb Ames, Wayne DeAngelo, Paul Fitzgerald, Warren Flicker, Cosmo Iacavazzi, Tom Kull, Erik Larsen, August Leming, Nina Melker, Scott Needham, Tom Perrino, Rocky Peterson, Steve Ritzau and Dennis Walsingham. The tournament is held in memory of Dr. Cynthia Schaffer, a local physician who served on the MCCC Foundation Board and was dedicated to giving back to the community. She focused many of her efforts on children’s health and youth sports. 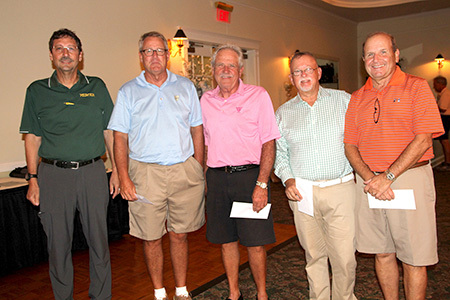 The tournament’s winning foursome included John Harrison, Dave Fraytak, Larry Melamed and Sam Scudieri. Additional prizes were awarded for longest drives for men and women and closest to the pin on five holes. From left, the Tournament's four main sponsors were Debbie Schaffer (Mrs. G's), Don Fowler (The Fowler Family) and Warren Flicker (Homosote). Not pictured Randy Feig (Investors Bank). They are pictured with MCCC President Jianping Wang. From left, MCCC Athletics Director John Simone with the winning foursome of John Harrison, Dave Fraytak, Larry Melamed and Sam Scudieri. 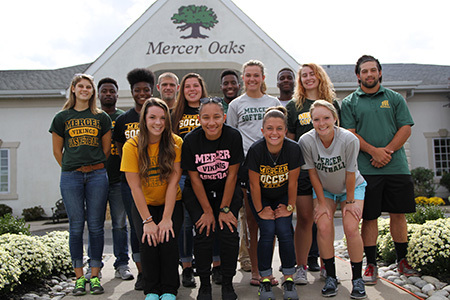 Students from MCCC teams represented the athletes who benefit from tournament proceeds. 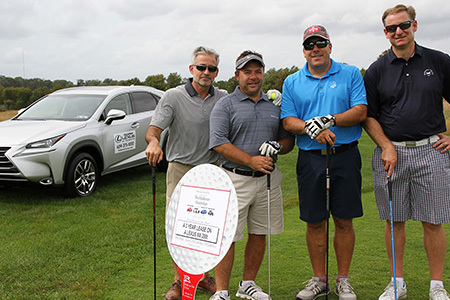 From left, Andy Salmon, Chris Castagna, Anthony Manto and Don Fowler pictured at the Hole-In-One site provided by Brian Bennett of Haldeman Lexus. This foursome took second place in the tournament. 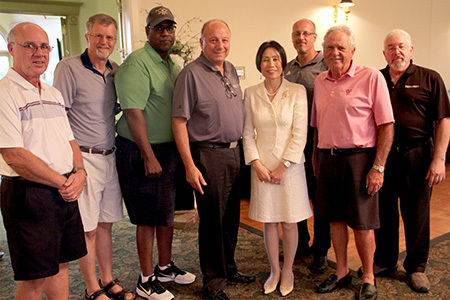 Among the members of the 2015 Golf Commitee, from left, Tom Kull, Steve Ritzau, Rocky Peterson, Allen Silk, MCCC President Dr. Jianping Wang, Tom Perrino, Dave Fraytak, and Warren Flicker. 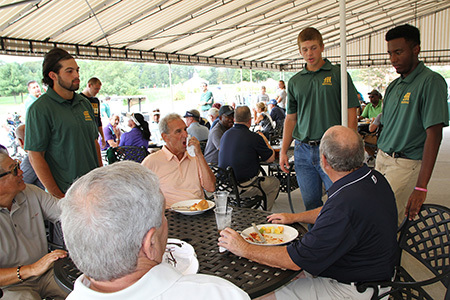 Vikings baseball players talk with golfers during lunch.